The Indian history witnessed the biggest ever scam during Commonwealth Games where public money amounting to Rs. 70,000 crores was embezzled. No surprise for us, because such things do not become an election issue here. It is the politicians who mutually decide what should be an issue. However if some enthusiast happen to raise some uncomfortable one he is immediately silenced, "Look, we too will expose you" and he becomes silent. 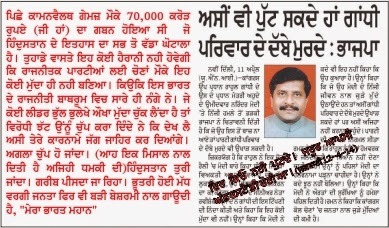 Here is an example of a such a news in Jagbani newspaper of April 12, 2014.